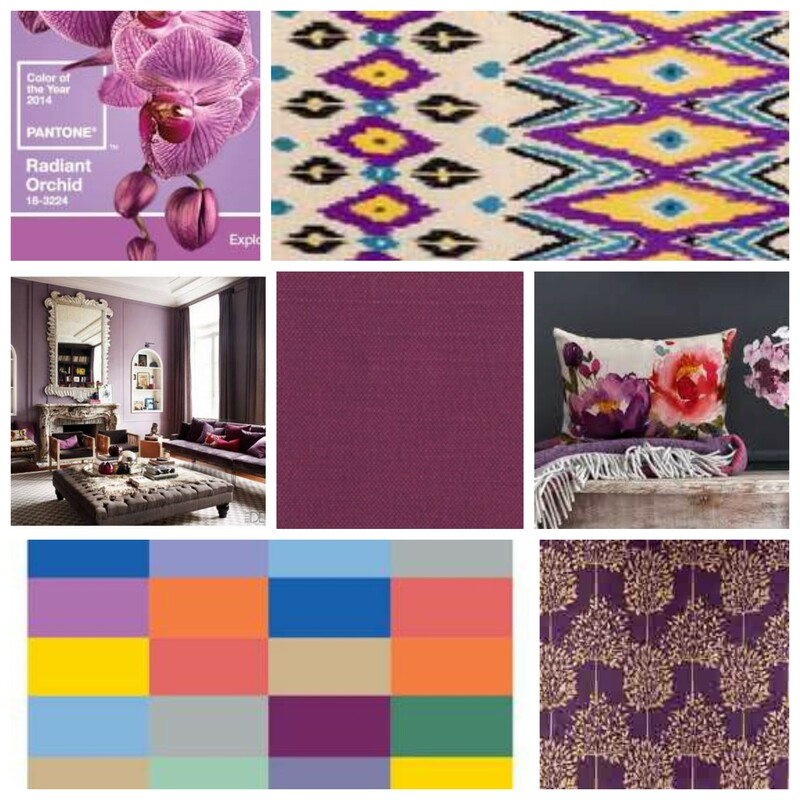 Pantone’s colour of 2014 is Radiant Orchid; a soft, vibrant purple.. As an early teenager I was allowed to decorate my bedroom as I wished & I chose lilac paint for three of the walls & a very dark moody purple for the other wall…not to everyone’s taste I admit & I would’nt want to live with it now but I loved that room & have fond memories of it, especially as it was a creation of my own. 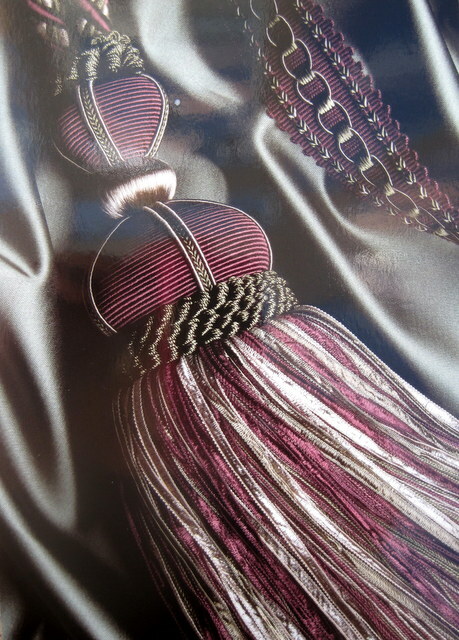 From the softest lilac to the deepest shade, purple can be a great accent colour for cushions, tiebacks & lampshades. So if you want to add one burst of colour to enliven & update your neutral scheme why not consider purple or one of the other lovely shades above which are so on trend for the new year. 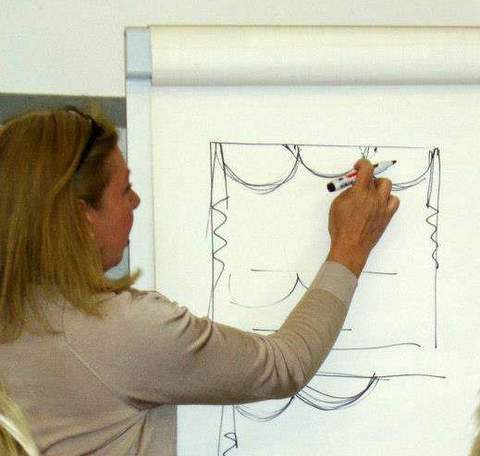 One of my professional highlights of 2013 was when I was invited to spent an evening & the following day in the company of 50+ fellow professional curtain makers at the beautiful Redbourne Hall, home of Merrick & Day. We were treated to a fabulous day of great hospitality & inspirational guest speakers with demonstrations by the talented Rebecca Day. We were awed by Bert Chapman MBE whose company holds the Royal Warrant. He spoke about the restoration of Windsor Castle following the fire & showed us a selection of fascinating sketches, technical drawings, bespoke fabrics & gorgeous passementerie. It was an honour to have this opportunity to meet Mr Chapman who has such fascinating & long experience at the pinnacle of our industry. My thanks go to the MyDecozo team, Catherine Merrick & Rebecca Day as well as their welcoming Directors & staff at Merrick & Day, Bert Chapman MBE, Wendy Shorter for informing us of the opportunities through Association of Master Upholsterers & Soft Furnishers & the many others who made it such a success. I can’t wait for the next MyDecozo meeting! 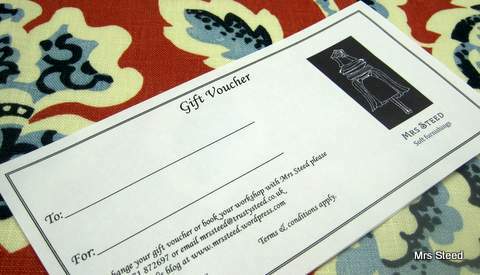 Gift vouchers from Mrs Steed can be for any value & may be used in part or full payment for products or a workshop. All gift vouchers are valid for 12 months & arrive with a pretty card & envelope. I can post them directly to the recipient for you. If your gift is a Lampshade workshop & you would like the recipient to have something more than the gift voucher to open, the lampshade kit can be provided with a voucher for the workshop to be redeemed at a later date. The kit comes packaged in a crisp white bag with a complimentary card, envelope & gift voucher for the workshop. Terms & conditions apply; gift vouchers cannot be exchanged for cash & no liability will be accepted for lost, stolen or damaged vouchers. Bi-fold doors are everywhere at the moment & understandably desirable as they have a lot to offer…but how to dress them? Even with the most up to date triple glazed units, glass is cold & in winter most of us crave cosiness. In this instance my clients had installed bi-fold doors accross the back of their extension to give them a wonderful view of the fields beyond their property with the added benefit of being able to open them up completely to the garden deck in summer. Having lived with their revamped home for a while they realised that they would like their lovely new room to be cosy in winter & chose curtains to achieve this. The brief was to create a contemporary curtain treatment which could be swept to one side when the bi-fold doors are open. My client liked the minimal look of eyelet curtains on a pole but as the width of the full span of doors & slim wall space either side is over 4m wide this posed a certain challenge, especially as the client wanted, ideally, one curtain which could run the full width of the room. During discussion of the various options my client decided it would be preferable to have two curtains but have one ‘free running’ in order to move it to one side when the doors are fully opened. We fulfilled the brief by using a discreet,high quality, track with smooth gliders which was wall mounted just under the coving. 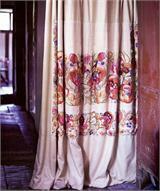 We made up the curtains in a single pleat heading as this is one of the most space efficient curtain headings. We also used a lightweight interlining to minimise the stack back. 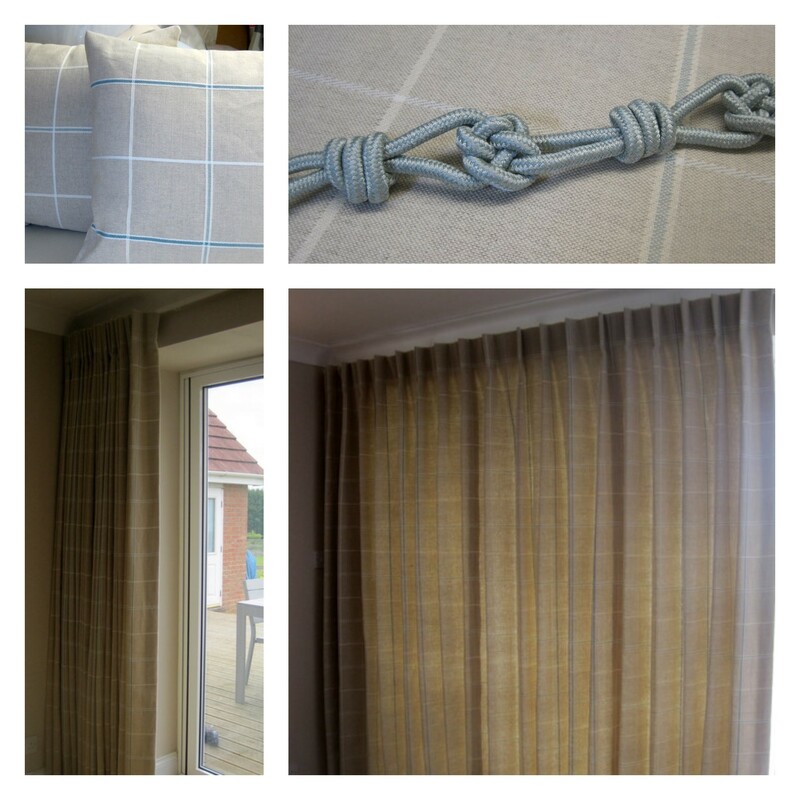 The curtains are hand drawn by clear draw rods so that there is no need to handle the fabric & we sourced an interesting rope design tieback in the same pretty duck egg colourway that features in the clients fabric. 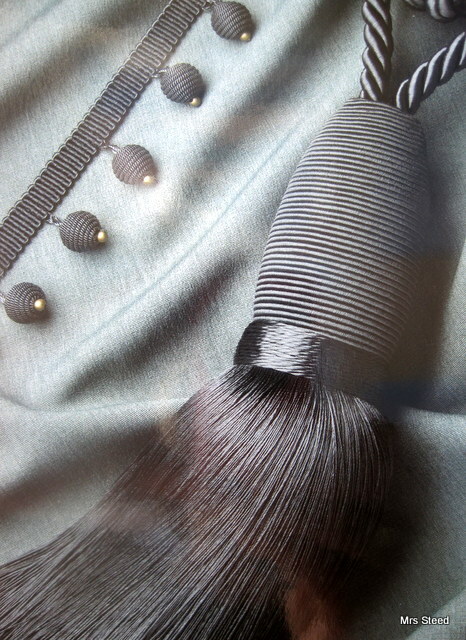 Whatever your home style… be it minimalist, smart tailored or influenced by the history of your home we have beautiful trimming to enhance your window treatments. If you are working on a tight budget a plain lower priced fabric can be made to look stunning by adding a coordinating or contrast trim. 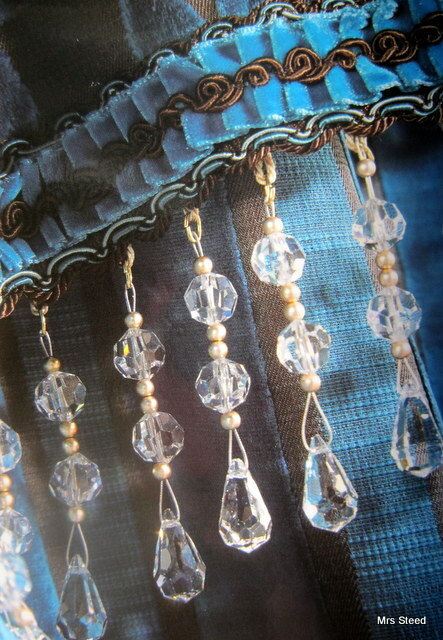 December 31, 2012 January 28, 2013 by Karen SteedLeave a Comment on New Year New Colour! 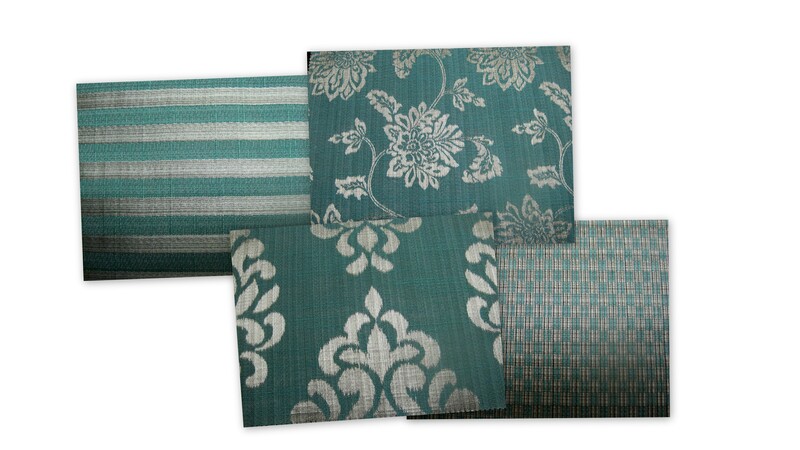 These lovely fabrics are available in several colourways, but take a look at them in Emerald which is the Pantone Colour of the Year (Pantone 17-5641 ) I recently used two of these beautiful fabrics in a scheme for a sitting room where different window treatments were needed for different sized windows; curtains with shaped pelmets & roman blinds with straight pelmets. (You can see pictures of them in ‘Shaped pelmets’ & ‘Straight pelmets’ here on this website). 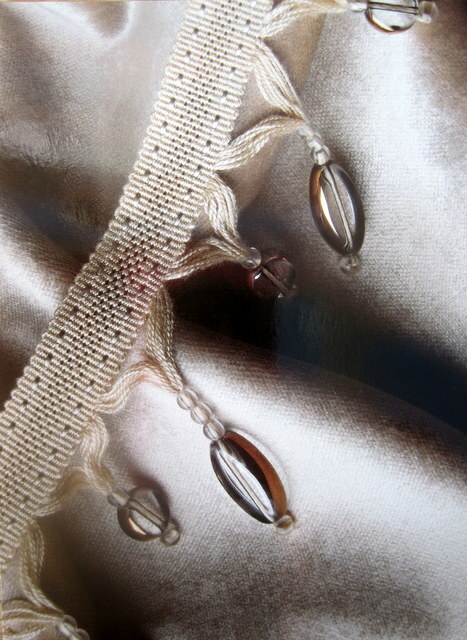 Contact me by phone or email if you would like to see the fabrics ‘in the flesh’; they have a lovely texture & soft sheen. Enhance your sense of well-being at home by rejuvenating the interior with Emerald accents, accessories & paint. 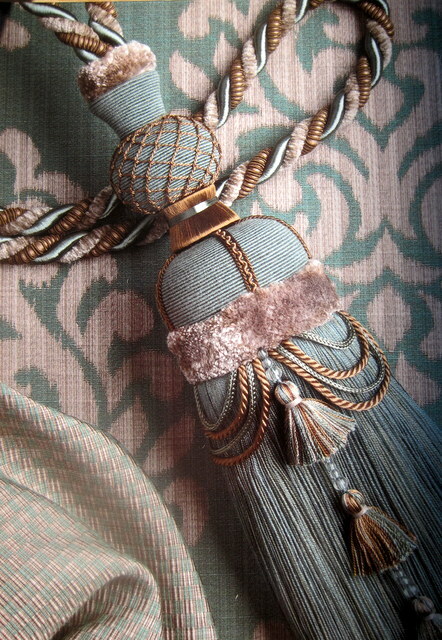 This jewel-like hue will create a luxurious feel in an entryway, powder room, dining room or study, and bring life to a living room as an accent wall. “Green is the most abundant hue in nature – the human eye sees more green than any other color in the spectrum,” said Leatrice Eiseman, executive director of the Pantone Color Institute®. “As it has throughout history, multifaceted Emerald continues to sparkle and fascinate. Symbolically, Emerald brings a sense of clarity, renewal and rejuvenation, which is so important in today’s complex world. This powerful and universally appealing tone translates easily to both fashion and home interiors.